Only 7 left! 7 items in stock. Do you have a good understanding of various sensors or need a variety of them for a project? This kit includes a sensor for just about every job. With everything included in this kit, you'll be able to sense gesture, humidity, temperature, motion, touch, sound, altitude, acceleration and more! These are some of our favorite sensors from each category. This version of the kit has received a complete overhaul! Check out the Kit Includes section below for a complete list of what is included in this kit to find out what has changed. This huge assortment of sensors makes an amazing gift for that very special electronics enthusiast in your life! Large Piezo Vibration Sensor - With Mass - A flexible film able to sense for vibration, touch, shock, etc. When the film moves back and forth an AC wave is created, with a voltage of up to ±90. Reed Switch - Senses magnetic fields, makes for a great non-contact switch. 0.25" Magnet Square - Plays nicely with the reed switch. Embed the magnet into stuffed animals or inside a box to create a hidden actuator to the reed switch. 0.5" Force Sensitive Resistor - A force-sensing resistor with a 0.5" diameter sensing area. Great for sensing pressure (i.e., if it's being squeezed). PIR Motion Sensor - Easy-to-use motion detector with an analog interface. Power it with 5-12VDC, and you'll be alerted of any movement. Mini Photocell - The photocell will vary its resistance based on how much light it's exposed to. Will vary from 1kΩ in the light to 10kΩ in the dark. QRD1114 Optical Detector/Phototransistor - An all-in-one infrared emitter and detector. Ideal for sensing black-to-white transitions or can be used to detect nearby objects. Altitude/Pressure Sensor - MPL3115A2 Breakout - Low-power, high-precision barometric pressure sensor with I2C output. SoftPot - These are very thin variable potentiometers. By pressing on various positions along the strip, you vary the resistance. 9 Degrees of Freedom IMU Breakout - LSM9DS1 - This chip provides a 3-axis accelerometer, 3-axis gyroscope, and 3-axis magnetometer. Connect this board over I2C or SPI and get started using one of the three sensors or using all three together to determine 3D orientation. RGB and Gesture Sensor - APDS-9960 - This board does a little bit of everything. You can measure ambient light or color as well as detect proximity and do gesture sensing all over I2C. Humidity and Temperature Sensor - Si7021 - A tiny (0.6"x0.6") board that will provide humidity readings as well as very accurate temperature readings. This I2C board is great for weather applications. Soil Moisture Sensor (with screw terminals) - Ever wonder if your plant needs water? This sensor outputs an analog signal based on the resistance of the soil. Since water is conductive, the soil water content will be reflected in the soil resistance. Capacitive Touch Breakout - This little board acts great as a non-mechanical button. Use the pad on the board or connect your own input for a great touch button with no moving parts. Sound Detector - Ever need to know if there is noise in an area? This board will not only tell you, but it will also output amplitude as well as the full audio signal. IR Receiver Diode - This simple IR receiver will detect an IR signal coming from a standard IR remote control or the IR diode included in the kit. IR Diode - This LED can handle up to 50mA of current and outputs in the 940-950nm IR spectrum. Use to send signal to talk to the included IR receiver diode or just turn off your neighbor's TV. Resistor 10K Ohm 1/6th Watt PTH - 20 Pack - 1/6th Watt, +/- 5% tolerance PTH resistors. Commonly used in breadboards and perf boards, these 10KΩ resistors make excellent pullups, pulldowns and current limiters. Resistor 330 Ohm 1/6W PTH - 20 pack - 1/6 Watt +/- 5% tolerance PTH resistors. Commonly used in breadboards and perf boards, these 330Ω resistors make excellent current-limiting resistors for LEDs. An overview of each component in the SparkFun Sensor Kit, plus links to tutorials and other resources you'll need to hook them up. 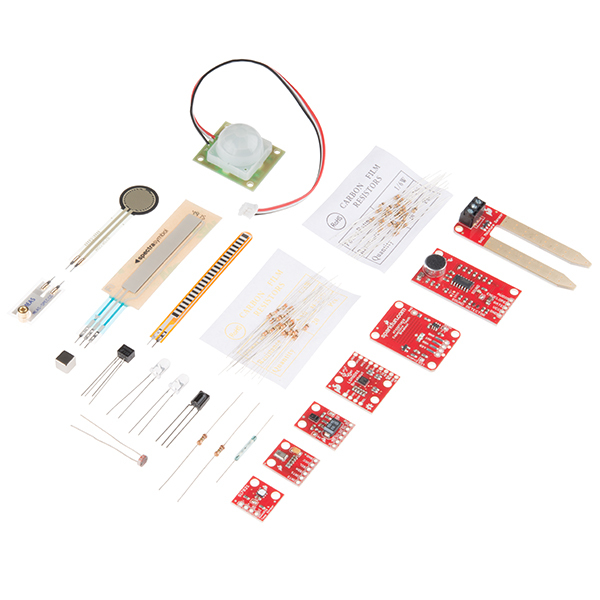 The SparkFun Sensor Kit is great value for the money. I think it includes most sensors that beginners with the Arduino or Raspberry PI might want to explore. The only thing to keep in mind is that you have to solder on any headers you might want to use for breadboarding. It would be nice to have a similar kit with headers already installed for real beginners! If there already is such a thing, I must have missed it!